The game supports up-to 4 players, local or online (using the Uthernet, DragonCart or RR-Net). 13 games servers are available, and results are recorded for competitive Ranking. So make sure to download the game and join us for some racing fun this holiday season! As for the ATMOS... I have already started porting the game, including development of an Arduino based ethernet card plugging into the printer port. Watch this space!!! Well done! Waiting for the Oric version with anticipation. From what I read here (http://osdk.org/index.php?page=articles ... T9#title17), AIC sounds like the best approach to achieve a colourful display. The one thing that worries me is the lack of hardware sprites. Do you know if someone has written some well optimized code for sprites with background redrawing? Generally speaking, there are no such thing as generic drawing routines on the Oric, at least not optimized ones, the reason being that the way you decide to draw things is highly dependent on the type of game, the size and number of sprites, if the background moves or not, if there is actually a background or just black stuff, if it's masked or not. A common method is to use a secondary buffer used for compositing (don't forget there's also no double buffering on the Oric: Every you draw happens on the physical screen), and then blitt that to the screen (using optimized rectangles) while reinitializing the buffer ready for the next frame. If all you have is four sprites over a static background, that should not be very difficult to have a relatively smooth animation, after all both Chema and Twilighte has been showing that you could have dozens of sprites moving all around with colorful backgrounds without much problems... with scrolling! Last question, were you planning to make a game for tape or disk systems? If you go the tape way, you lose 16 kilobytes that could have been used for additional buffers or fast display routines with unrolled code. Thanks for this information, it is good to know that others managed to get loads of sprites on screen with a background. I plan to release the game on DISK, to load the race map information on demand. The module supports ethernet connections (UDP/TCP), and 4 joysticks!!! With this latest progress, I might have the port of 8bit-Slicks ready in something like 2-3 months. The above does not include various shipping costs assosiated with getting the items from various vendors, and the time I will spend making each unit. It would make sense to produce several units in a first batch, so I have a small team of testers before releasing the game. Got a lot of hardware (Atmos, Oric-1), but to be honest, little time to focus on complicated tests. You don't need anything else at the other end, just an internet router. This is going to be a box with one side to connect ethernet cable/power, and other side to connect joysticks/atmos. 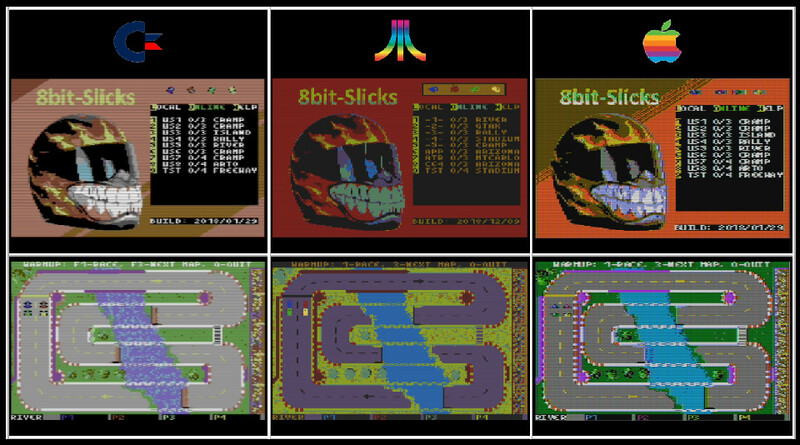 It is meant for testing online play of 8bit-slicks (at least at first, I have more games coming in future). That would be possible if I upgrade the UNO to a Leonardo. I could then integrate this functionality as well into my 8bit-unity API. Sky's the limit! I am only trying to make a proof of concept to start with. If there is demand for this, we can think how to make it smarter.